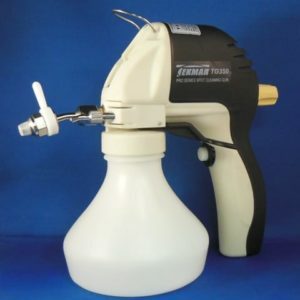 We are pleased to introduce our new Spot Cleaning Gun the TARGET TG 300. This gun represents a major advancement in gun technology. The pump design incorporates a system that allows an increase in fluid stream with no increase in fluid consumption. 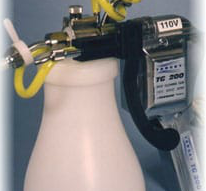 This allows for faster, more complete cleaning, which lowers production costs and reduces the operator’s exposure time. The handle is molded from Fiberglass reinforced Styrene, to resist breakage. The ergonomic design of the gun distributes the weight over the whole hand and wrist, helping to reduce operator fatigue. The extra wide container, makes the TG300 more stable and helps eliminate accidental breakage. 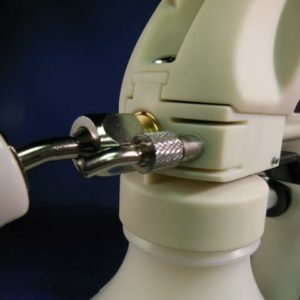 Available accessories include, an Air Dryer to greatly speed up production and a Direct Feed hose to eliminate refills. This machine is a soldier! I have used several other brands and models, nothing has lasted longer or performed better than the TG300.